Jews, Protestant evangelicals, and Orthodox Christians will find Pope Benedict’s words this morning of particular interest. The Pope, in different ways, is reaching out to each group. And in this outreach, Pope Benedict does not cease to surprise, even to astonish. Pope Benedict continues to give us hints about what he wants those who listen to him and who follow him — both Roman Catholics and all other men and women of good will — to focus on in the days ahead, in our increasingly secularized world. What Benedict wants all to focus on, Catholic and non-Catholics, believers and unbelievers, is the great “missing element,” the great “not present” in our modern world and society: that is, the hidden God who is the source of all being and goodness, and the true end and answer to all human hopes and longings. This morning, speaking in English during his General Audience (his next to last General Audience as Pope), Pope Benedict mentioned three people as examples of “radical conversion” who were “raised up by the Lord” as “examples” during the past century: Pavel Florensky, Etty Hillesum and Dorothy Day. Benedict’s choice of these three, from a certain perspective, could not have been more provocative… because none of the three can be considered a “model” Catholic. None of them were raised in the faith. In fact, the first two people mentioned by Pope Benedict this morning, a brilliant Russian Orthodox philosopher (Pavel Florensky, who was executed by the Soviet regime in the 1930s) and a sensitive Jewish woman writer killed at Auschwitz (Etty Hillesum), were never Catholics at all. Each was true to a desire, a longing, in their hearts, which set them out, as it sent out St. Augustine, on a search for truth, on a search for that ground of reality which could satisfy their deepest longings. This is what Pope Benedict is stressing today. He is reaching out to all and saying to all, be true to your deepst longings, to your deepest desire to reach that hidden infinite, that absolute which is also personal, which your soul longs for. This is the message of the Pope to Catholics at this time. The message is: deeper conversion. The Pope is at pains to make one, central point: that, though values, morals, customs and traditions are critical for mankind, for sinful and imperfect men and women, to come to a more reasonable, more balanced and more “sane” (healthy, healthful, vibrant) human life, the true, mysterious, radical “source” of the fullness of human life and health and sanity and blessedness — that is, the fullness of being saved from frustration and sin and death, the fullness of salvation, of eternal life — is an encounter with, a connection to, a sharing of the very divine life of, God, and of the Son of God, the risen Lord, Jesus of Nazareth. Those evangelical, Protestant Christians who feel that the Catholic Church, with its vast, global structure of offices, laws and institutions, has lost sight of this central fact, of the need for a personal relationship with Jesus Christ, should feel moved to reconsider their position by these very clear words of this Pope, who is now speaking in the final 15 days of his papacy, so his words in these days may be seen as a sort of spiritual testament. He is placing God at the center. He is placing Christ at the center. Not himself, not his papacy, not the institutional Church. Those Jews who have half-suspected, or have even been inwardly certain, that this Pope, a German who was forcibly conscripted into Hitler’s army in 1943, was not a friend to the Jewish people, should be startled by his choice of a young Jewish woman, killed at Auschwitz, as one of the “models” of spirituality he would choose to present at one of his final public audiences. And those Orthodox who wonder if the Roman pontiff truly respects the Orthodox and their profound spiritual life and tradition, should be moved by the fact that the first name mentioned today by the Pope, in the next-to-last general audience of his pontificate, is the martyred Russian Orthodox theologian, Pavel Florensky. 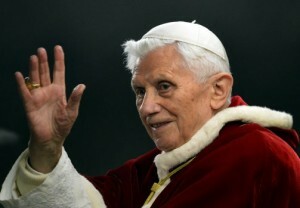 Looking calm and serene, Benedict XVI led his first public appearance, after announcing his resignation. Before a full crowd, he once again said he made the decision with complete liberty. He echoed Monday’s statement by saying that he does not have the strength to carry out the office. Then he continued with his weekly catechesis, on Ash Wednesday. He talked about the temptation Jesus experienced when He was in the desert. In today’s modern world, said the Pope, temptation is to push faith aside and seek false solutions. During this Lenten season, the Pope invited people to open their minds and hearts, as Christ knocks on their door. A source of true inspiration, he says, is that Jesus himself overcame temptation out in the desert. The Vatican’s Paul VI Hall was full of pilgrims who greeted the Pope, interrupting him with applause throughout, to show their gratitude for the last eight years.